Last night I was able to cross another open water adventure off my list by swimming in the Great Salt Lake. After reading about the marathon swims that used to take place in the lake, I have been looking for an opportunity to join the ranks of adventurous swimmers by completing a swim there. Between the extremely salty water, brine shrimp and shallow waters, it can rightly be called an adventure. I met Gordon, his wife Cathi and his son Jacob at their home yesterday evening and, after packing up their boat and all of our snacks, drinks and gear, we headed to Antelope Island State Park. We pulled up the the marina and Gordon backed the boat down the ramp and into the water. There were swarms of small bugs all along shore and the boat ramp. It actually looked pretty cool when you took a step and they all scattered. There were plenty of mosquitoes in the air, but they didn't seem to be biting. The water in the marina was murky and brownish in color. As you got down close to the water you could see the hundreds of brine shrimp happily swimming around, oblivious to the condition of the water we were about to swim in. I had to run back to the van to get my earplugs because the last thing I wanted was to have these little guys move the party into my ear canals. This was my first time swimming in the Great Salt Lake, and I can tell you that the rumors of "floating like a cork" are true. I felt extra buoyant in the water, similar to when I wear my wetsuit. The water on the surface was warm and was probably in the lower 70's. We started our swim by heading northwest out of the marina and into the lake. Once outside of the marina we swam west towards a point on the shore that is not visible on the satellite map. The water was extremely salty and despite my best efforts, I ended up with some in my mouth. After a while it felt as though my tongue was going numb and my nose and throat started to "burn" from the salt. We had to stop every once in a while so that Cathi and Jacob could toss us water and Gatorade to wash out our mouths. After rinsing my mouth out I felt fine. One of my worries about swimming the in the Great Salt Lake was the water depth. According to Utah.com, the lake is only 33 feet deep at it deepest point with an average depth of only 20 feet. I was worried that we would be "beached" and not be able to swim. Fortunately, there were only a few spots during the swim where I put my feet down and touch the bottom. After reaching the point on the shore that we were aiming for, we decided to keep going around the the campground area. Maybe it was just a sodium induced hallucination, but the water actually seemed to get less salty as we swam towards the campground. After swimming for a while longer, the water became too shallow and we started to scrape the bottom as we stroked. We decided that it was a good place to turn around and headed back. As we rounded the point on the northwest tip of Antelope Island, the water seemed to again get saltier. The water also started to get a little choppy and I had to adapt and breathe only on my right side to avoid getting small waves in my face on my left. Despite the salt and the smell, it was really quite beautiful being out in the water. The sun was starting to set and the sky turned a pinkish color on the horizon. I could see Antelope Island when I breathed on my right and Fremont Island when I breathed on my left. I think my pace picked up as we entered the marina because, to be honest, I was ready to get out of the super salty water. I had tucked my GPS between my two caps before we started and I was curious to see how far we had gone. The GPS read 2.52 miles and we had been gone for an hour and twenty minutes. After adjusting for the times we we stopped to rinse out our mouths and talk, we were actually swimming for about an hour and ten minutes. We stepped out of the water and back into the swarms of bugs on the shore. Other than the inside of my bottom lip being "pickled" from the salt water, I felt great. We got the boat back onto the trailer and headed back over the causeway to the "mainland". While I have no plans of making the Great Salt Lake my primary training ground, it was an adventure that I would not rule out doing again. In fact, Gordon and I are making plans to swim the 5 or so miles between Fremont Island and Antelope Island. Anyone want to join us? This is actually something that I've thought about doing...I'm a slow swimmer, but totally game. Let me know if you guys go out, again. I would love to do this also. Good job guys! 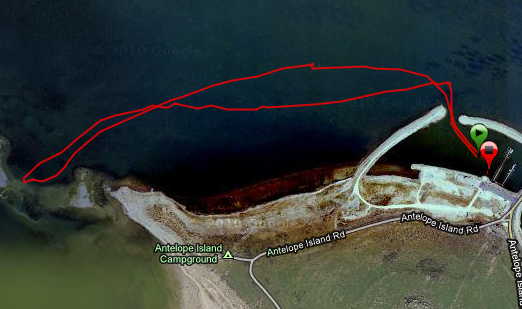 We are hoping to do a swim between Fremont Island and Antelope Island sometime next month. I will be sure to post the details here.